This large whale weighs an average of 30 tonnes, ranging in length from 12 to 16 metres. The female Humpback Whale is normally one or two metres longer than the male Humpback Whale. They have two blowholes. They range in colour from almost white through to gray and black. The word “Megaptera” translates to “huge wings” referring to the large flippers the whale possesses. If a Humpback is spotted along the coast, it turns immediately into a great tourist attraction. Locals and visitors stop to see the amazing whale leap out of the water in gigantic somersaults, before crashing back through the sea. Other times they are known to roll on the surface of the water. When out of the water, they flap their flippers. An amazing sight to witness. Humpbacks are found all over the world, however there are only about 2,500 remaining thus making this an endangered species world wide. Even with their huge size they still have predators. Killer Whales are known to attack Humpbacks, and unfortunately, so too are humans. These amazing creatures have been hunted to near extinction. Did you know? A large humpback whale can weigh up to 60 tonnes! The Humpback Whale has a bulky head with protuberances, which makes it easily identifiable. They usually travel in groups, travelling at around 10 km/h through the water. They have been reported to reach speeds of just over 25 km/h when threatened. Humpbacks are known to be the most vocal of all whales, emitting long complex sounds. 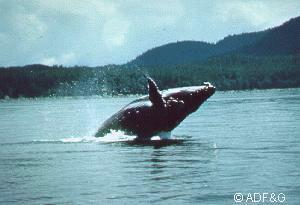 They also have the largest frequency range out of any other known whales, reaching 20 to 9,000 Hz. E-mail to add your Humpback Whale related website.